Does this means that we are going to get the other characters also? 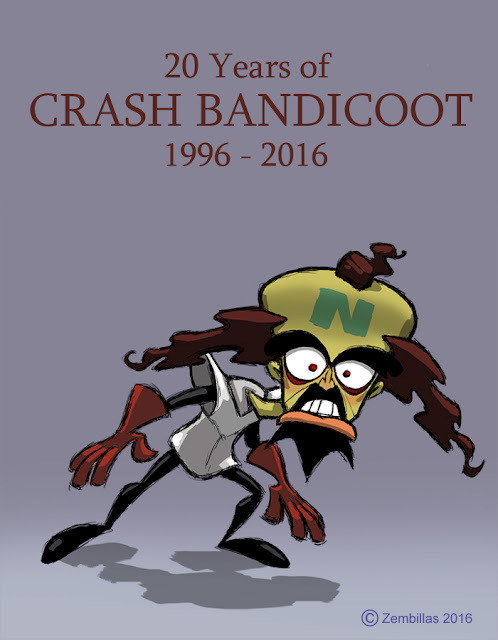 I always see Crash and sometimes Cortex in your blog and that's great, but it would be awesome to see all the other characters after all these years, how they evolve with your style. Can't forget about our favorite evil scientist. Im also doing a Cortex drawing but it's going to be his doppelganger of a idea of mine. Are we going to see more characters cause that would be neat! Anyways I just had to ask a silly question, did you originally design Dr N.Gin? Because a friend of mine really needs to know what those 'holes' are on his labcoat. I was going to ask on your old N.Gin post but I thought I better ask here instead. She's just curious! Thank you Tara! I designed N Gin. Honestly I'm not sure what those holes are in his suit. I was thinking maybe some vents or maybe something that hoses would attach to. Purely a design element without giving it much further thought as to purpose. Thanks again for your comments. If you have art online let me know. I'd like to see what you do. Hey! Thanks a bunch for the reply, much appreciated! And heh, well that's alright. My friend (and myself, I suppose!) always wondered what they were but I guess the mystery of N.Gin's labcoat is finally resolved now; in a way. Thanks! You may notice that some of the designs are directly based on some of your unused concept designs (Karmen, Shelia, Hayden) just to pay some homage to your work. I really should try and comment more often, I think I was just a bit too shy before because I've been following your blog here for the past 3 years or so! But yeah, I really do appreciate you taking time to share your work with us. So thanks again, always looking forward to seeing more! You're very talented and you have a unique style. Looks like you're using traditional mediums which makes it even more impressive. Thanks for the link! Hope to see more of your art in the future.